First before I jump into the book, I have to say that this book and the previous one I talked about, Tohopeka, my friend Jim Parker with the Alabama Historical Commission contributed a lot of material. Especially with the huge list of historical sites in Alabama in the back of Tohopeka. Jim is one of the most knowledgeable people on the subject of the War of 1812 along the Gulf Coast, but is not given enough credit. 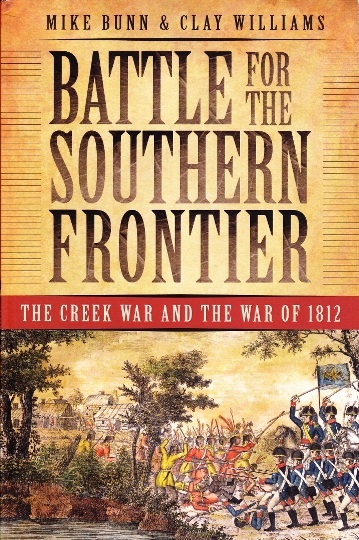 Anyway, this book, Battle for the Southern Frontier, was one of the recommendations from Kathryn Holland Braund in Tohopeka. So I ordered a copy, and have finished it. If you want a crash course in the Creek War & War of 1812, then this will fit the bill. It breaks it down into the four different campaigns of the war along the upper Gulf Coast. The chapter, “From Burnt Corn to Holy Ground, follows the Mississippi Militia in the first part of the war. It covers most of the sites around the South Alabama/Tensaw area. The progression of the territorial militia is followed from its disastrous beginning, to the destruction of Econochaca Town at the battle of Holy Ground. Following each chapter is a list of the sites listed in the chapter, what the status is of them, and if anything that remains today that you can visit. Often there is at least a historical marker. So this book can also serve as your travel guild to historical sites in Alabama related to the Creek War. The second campaign covered is also the one that has the least written about it, when the Georgia militia crosses the Chattahoochee and fights the Creeks. Following that, the Tennessee troops become involved. It was not just Andrew Jackson, but two different armies from Tennessee with rival generals who saw each other as rivals and didn’t like to talk to each other. Because of the miscommunication, the town of Hillabee was massacred after they had surrendered. But Andrew Jackson learned from the mistakes, called in several thousand more troops and the regular Army infantry, which led to the total destruction of Horseshoe Bend and the biggest defeat and killing of any Native American Tribe in US history. With the Creeks humiliated and broken, Jackson forced one of the largest land cessions in US history upon them, and punished even the Creek allies who helped him. From there was the fourth campaign of the war, where Jackson went down to the Gulf, took Pensacola from the Spanish, prevented the Brits from taking Mobile, and defeated the Brits at New Orleans as one of the most decisive battles in US history. I went through it fast, but the book is hardly finished from there. There is a timeline of events at the beginning of the book, and after the history is a list of Who’s Who from the Creek War with several short biographies. Then are reprinted ten original documents of eyewitness accounts, reports, and letters of the war, including the Treaty of Fort Jackson. And finally, instead the boring bibliography, is an essay of the sources used in the text, that can give you an idea of what books you might want to track down for further information. Like I said, this book will give you a great run-down on the war. It can also be a travel guide, and a list of sources to get more information. I highly recommend it.